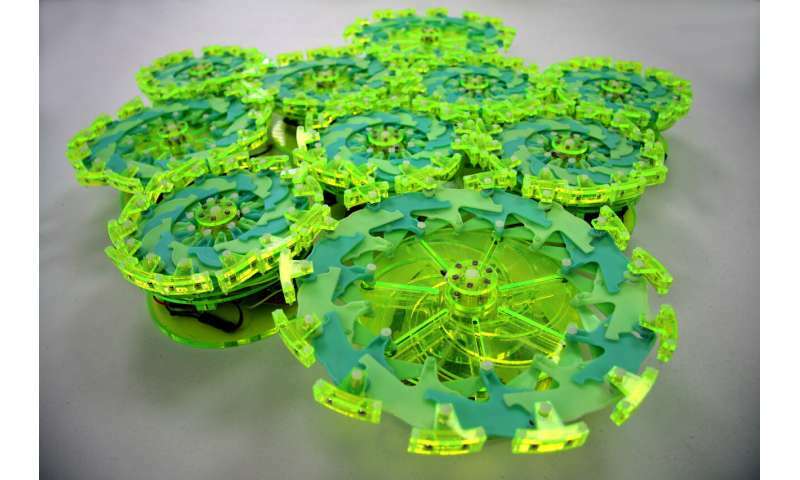 This so-called "particle robotics" system—based on a project by MIT, Columbia Engineering, Cornell University, and Harvard University researchers—comprises many individual disc-shaped units aptly named "particles." The particles are loosely connected by magnets around their perimeters. Each particle can only do two things: expand and contract. But that motion, when carefully timed, allows the individual particles to push and pull one another in coordinated movement. On-board sensors enable the cluster to gravitate toward light sources. In a Nature paper, the researchers demonstrate a cluster of two dozen real robotic particles and a virtual simulation of up to 100,000 particles moving through obstacles toward a light bulb. They also show that a particle robot can transport objects placed in its midst. This video shows a single cell oscillating from an oblique view and then a top view. The video also demonstrates particle robot locomotion with a group of cells oscillating with position-based phase delay. "We have small robot cells that are not so capable as individuals but can accomplish a lot as a group," says Daniela Rus, director of the Computer Science and Artificial Intelligence Laboratory (CSAIL) and the Andrew and Erna Viterbi Professor of Electrical Engineering and Computer Science. "The robot by itself is static, but when it connects with other robot particles, all of a sudden the robot collective can explore the world and control more complex actions. With these 'universal cells,' the robot particles can achieve different shapes, global transformation, global motion, global behavior, and, as we have shown in our experiments, follow gradients of light. This is very powerful." At MIT, Rus has been working on modular, connected robots for nearly 20 years, including an expanding and contracting cube robot that could connect to others to move around. But the square shape limited the robots' group movement and configurations. In collaboration with Lipson's lab, where Li was a graduate student until coming to MIT in 2014, the researchers went for disc-shaped mechanisms that can rotate around one another. They can also connect and disconnect from each other, and form into many configurations. Each unit of a particle robot has a cylindrical base, which houses a battery, a small motor, sensors that detect light intensity, a microcontroller, and a communication component that sends out and receives signals. Mounted on top is a children's toy called a Hoberman Flight Ring—its inventor is one of the paper's co-authors—which consists of small panels connected in a circular formation that can be pulled to expand and pushed back to contract. Two small magnets are installed in each panel. This video shows the experimental procedure for particle robot phototaxis, including the phase reset period when the overhead lights are turned off; this is generally removed from the videos to reduce the video length and file size. This video also shows the behaviours demonstrated with phototaxis, specifically locomotion towards changing light sources, cooperative object transport, and obstacle avoidance; these experiments correspond to Fig. 3a-3c. The sensors of a particle detect the intensity of light from a light source; the closer the particle is to the light source, the greater the intensity. Each particle constantly broadcasts a signal that shares its perceived intensity level with all other particles. Say a particle robotic system measures light intensity on a scale of levels 1 to 10: Particles closest to the light register a level 10 and those furthest will register level 1. The intensity level, in turn, corresponds to a specific time that the particle must expand. Particles experiencing the highest intensity—level 10—expand first. As those particles contract, the next particles in order, level 9, then expand. That timed expanding and contracting motion happens at each subsequent level. 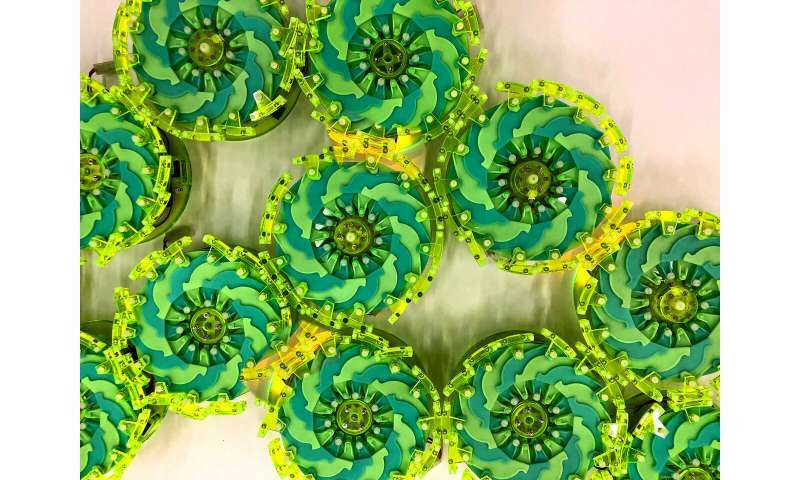 "This creates a mechanical expansion-contraction wave, a coordinated pushing and dragging motion, that moves a big cluster toward or away from environmental stimuli," Li says. The key component, Li adds, is the precise timing from a shared synchronized clock among the particles that enables movement as efficiently as possible: "If you mess up the synchronized clock, the system will work less efficiently." In videos, the researchers demonstrate a particle robotic system comprising real particles moving and changing directions toward different light bulbs as they're flicked on, and working its way through a gap between obstacles. In their paper, the researchers also show that simulated clusters of up to 10,000 particles maintain locomotion, at half their speed, even with up to 20 percent of units failed. "It's a bit like the proverbial 'gray goo,'" says Lipson, a professor of mechanical engineering at Columbia Engineering, referencing the science-fiction concept of a self-replicating robot that comprises billions of nanobots. "The key novelty here is that you have a new kind of robot that has no centralized control, no single point of failure, no fixed shape, and its components have no unique identity." I thought the "gray goo" was a bad thing...?